Below are various original pieces created by the film's directors, Christopher, Stephen and Jonathan Phelps, which tell the story of the film. 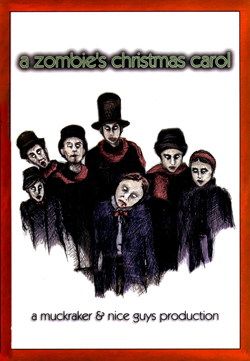 "A Zombie's Christmas Carol" was the first film Jonathan made with his two younger brothers, Stephen and Christopher Phelps, as well as the first Muckraker/Nice Guys collaboration, more recently known as The Ravacon Collective. This 15 min fllm is full of B-movie holiday fun for the whole family, with flying red blood and spraying green zombie goo to help spread the Christmas spirit!